Going to the gym to work on my fitness is an essential part of my daily routine. I love the feeling of working towards something that at first seems unattainable and then proving myself wrong. Exercise has improved all aspects of my life. I joined the gym 8 months ago, regularly exercising five times a week and I can tell you physically, mentally, and spiritually I have never felt better. Whether it be getting down with my bad self at a Zumba class or kicking major bootay at Turbo Kick; regular exercise has provided me with confidence, strength, and clarity. Throughout my fitness journey I have acquired tons of knowledge about proper eating habits and effective workouts, one of which is the importance of strength training for women. A lot of females avoid lifting weights because they feel as if it will make them “bulk up” or they are scared of the weird stares from men indicating that they do not belong. Never one to shy away easily, I combat weird stares from men by playing up my girly attributes. Sure they may snicker when they see me perkily walking towards the heavy weights with pink bows in my hair but I find when I look my best, I work out my best. And in the end isn’t that purpose. Trendy Sports Bra – The gym may be the only place appropriate for a girl to show off her bra in public. Might as well make it sassy! I personally love choosing brightly colored or patterned bras because they are an easy way to mix in your personality into a work out ensemble. Hair Bows – Who says that ponytails have to be boring? Hair bows and colored headbands/hair ties are an easy way to mix in color into your workout attire. Put that sucker up in a p.tail and slap on a bow, and you are good to go. Watches – Wearing a watch to the gym makes it easy to time your workout, circuits, or strength training moves and are overall just a practical decision. I love this G-Shock watch because of the vivid violet hue. Slogan Water Bottles – Drinking water is so imperative when you are working out. Although it may taste bland, your exercise bottle certainly doesn’t have to be! I always buy water bottles with fun slogans on them because for me they encourage me to workout. Right now I sport the green Victoria’s Secret water bottle that states “Let’s work it out.” Every time I see it I’m motivated to plan my exercise for the week and to drink more water. 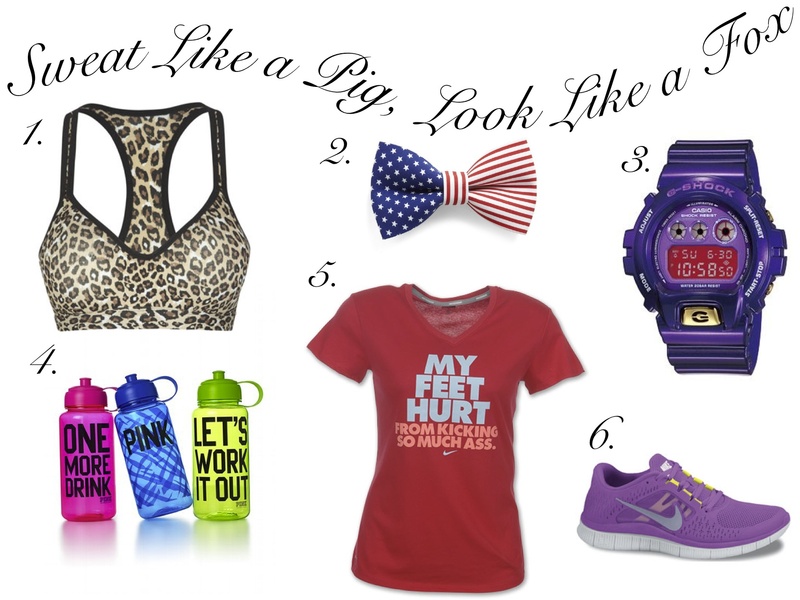 Sassy Shirts – Shirts with witty phrases such as this Nike one are my absolute favorite. I feel like when I’m in the weight room with a T-shirt or tank similar to this, guys definitely don’t want to mess. Colorful Sneakers – When exercising, shoes that support your activities are essential. When choosing the right shoe you want to look for comfort, longevity, and a style that is suitable for you. Shoes are also a great way to integrate color into your workout attire but if you like your look to be more cohesive neutral colors may be the way to go.